Update, 6/20/18 (see Bibisco section below). I will acknowledge at the beginning that articles such as this one can be viewed as a distraction from, or evasion of, “real” writing. And God knows I have several projects I should be working on instead. But I find the tools writers use to be a fascinating subject (and I’m not the only one). Moreover, the focus of this piece—using open source tools to do your work—strikes me as especially timely in light of recent concerns about the intersection of commercialization, privacy and technology. I think most writers should find something of interest below. This article, then, will provide a brief evaluation of a number of open source programs designed for writers. The one prerequisite for inclusion here is that such programs run on Linux. While I do much of my work on a Mac (which remains, in many ways, the “creative” platform), Linux has become increasingly important in terms of autonomy, freedom from commercial exploitation and privacy (Tim Cook’s protestations notwithstanding). The OS is in the process of becoming quite a decent platform for writers, as well. My dual-monitor Linux desktop, showing various open source apps. I’ll mention a few commercial writers’ programs up front, just for contrast. One of the problems with proprietary software is clearly demonstrated by the recent decision of Ulysses to employ a subscription model. I regard this form of pricing as a kind of extortion: pay us a monthly fee, or else. Unfortunately, this model has become more prevalent in recent years. Blame Adobe, the company that started it all. Microsoft isn’t helping, either. Another potential problem with proprietary software involves security and privacy. Not every software maker is as transparent as it could or should be, and there are times when you should be very cautious as a consequence. For example, I was initially impressed by the program Write!, which I’ve mentioned more than once on this site. But the program’s developers have not offered any public transparency concerning their location and personnel (both are potential issues), and the program itself still requires you to log in order to use it, which is both unnecessary and quite dubious from a privacy and security standpoint. I no longer use this software and can’t recommend it. 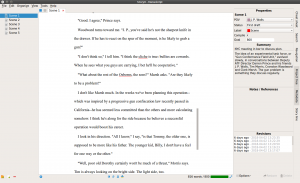 Not every proprietary program is potentially hazardous or exploitative to use, though—Scrivener is generally exemplary in its pricing, customer relations and overall quality. 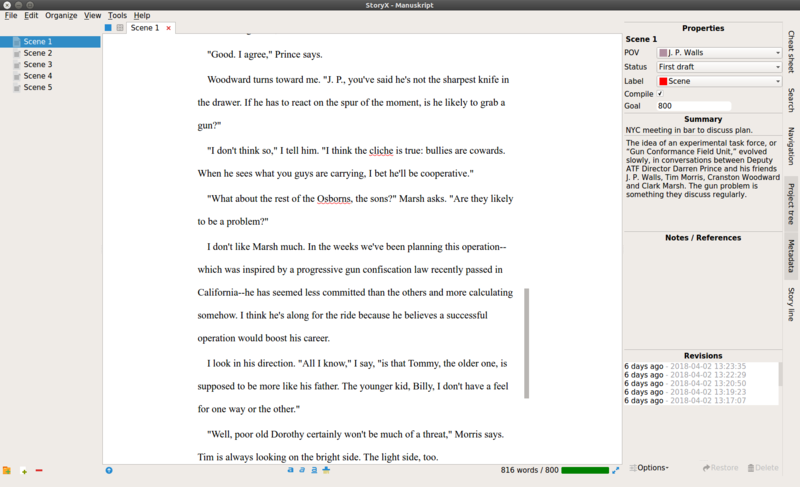 As I noted in my recent review of Scrivener 3, the program looks as though it will run fine under Wine on Linux, and I will be happy to buy a license to use it there, as well as on my Mac. But Scrivener is arguably an exception. You’re likely to encounter pitfalls of one sort or another with much commercial software, not least an endless, too-frequent “upgrade” cycle. Free and open source software is another paradigm altogether. OK, then. Let’s start our survey with LibreOffice Writer, an extremely capable word processor that in my opinion renders Microsoft Word unnecessary for the majority of writers. Yes, Word remains the publishing “standard” for both books and periodicals. 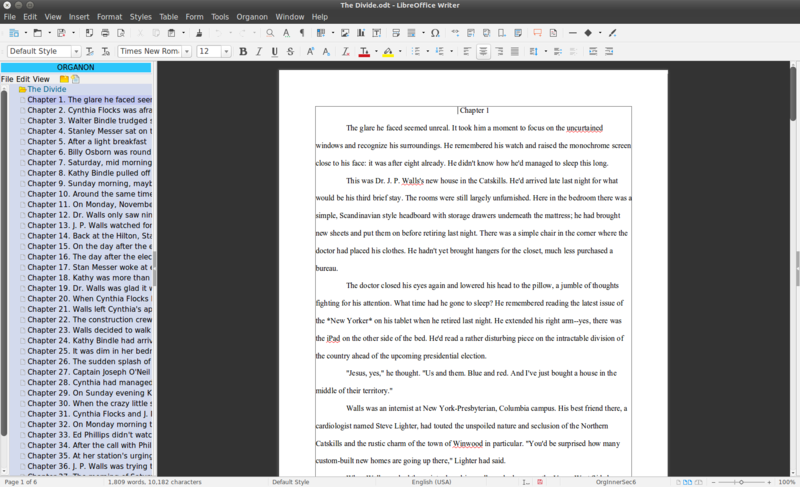 But Writer is so adept at producing compatible .doc and .docx files that Word really isn’t necessary in this context. 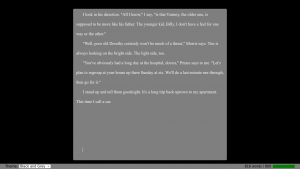 Writer’s Track Changes feature operates seamlessly with Word’s, at least in my experience, and formatting for novels, short fiction and poetry is straightforward enough that compatibility issues are a thing of the past. It wouldn’t hurt you to have Word available for some unforeseen contingency but as a writer you really don’t need it. And Writer is available on Mac and Windows, as well as Linux (the same is true for all of the software mentioned below). What’s more, Writer can be customized for particular needs. 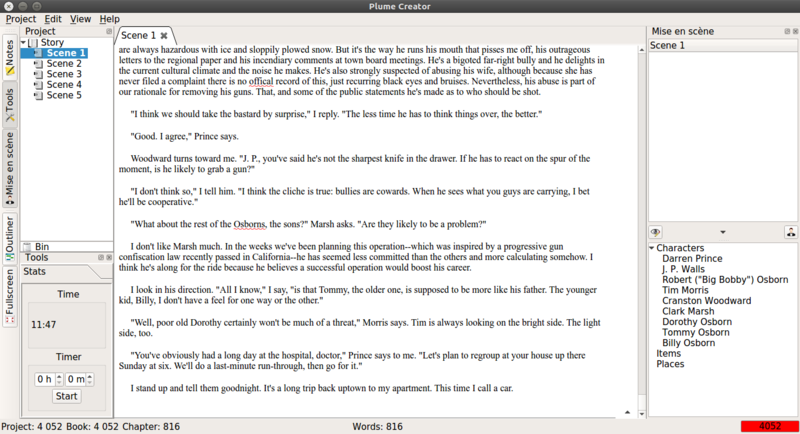 There is a terrific plugin called Organon which turns Writer into a Scrivener-like tool for novelists which can organize your work by chapter, scene or section and also give you a place to store notes on characters, locations, etc. 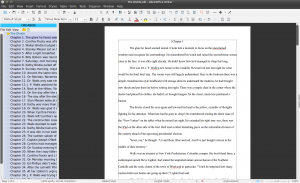 Here’s the first draft of a novel in LibreOffice Writer. The Organon plugin enables the book to be conveniently organized by chapter. 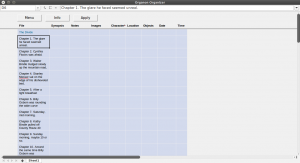 Organon’s Organizer feature provides storage for synopses, character/location notes, images and more. For shorter work, look no further than Graeme Gott’s excellent FocusWriter. 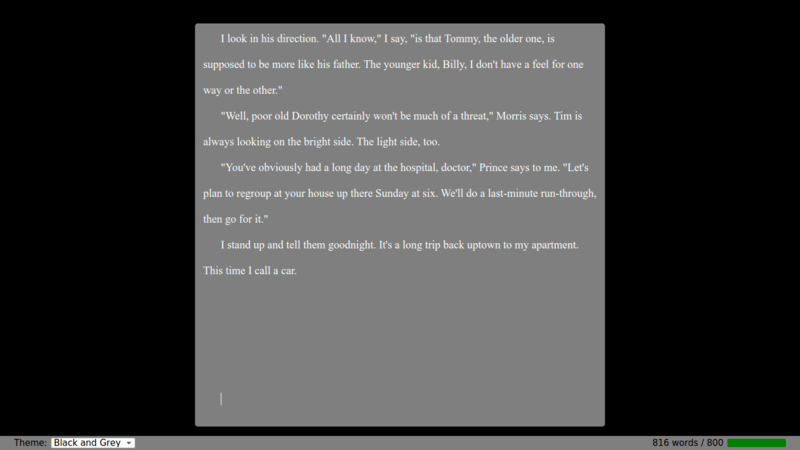 This is a very attractive distraction-free writing program that can handle switching between individual scenes or chapters and also offers basic tools like daily goals and the ability to save to .rtf and .odt formats. FocusWriter deserves a review of its own, which I’ll try to provide at some point. 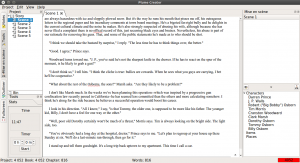 The following three programs try to do what Scrivener does so well: provide an environment conducive to longer creative work, especially novels. None of them can yet equal Scrivener but they are surprisingly capable in their different ways. There is an update for the general summary of Bibisco below. The 2.0 version of the program is now based on node.js rather than Java, and it’s not backward-compatible. However, the look and feel are much the same as they were before (though full-screen mode is now possible). The program has now been divided into a “community edition” (free) and a “supporters editon” (minimum €10 donation). For the donation you get the option of enabling the ubiquitous “dark mode” that seems to have overtaken most of today’s software. Now, I have no objective to supporting open source projects with donations—I support several of them. But I think this new Bibisco “freemium” mode is inappropriate for an open source project. Either go commercial or don’t, but don’t try to split the difference. Bibisco (I have no idea what this name means, but it sounds nice, like biscuits and cookies) is open source software from Andrea Feccomandi in Italy which is aimed at novelists. It is very much oriented toward planners rather than “pantsers” (as in “seat-of-the-pants” writing born of experience and instinct). The program asks you to define your characters and their desires in quite extensive detail before you begin writing, although of course you can choose to ignore this. Such extensive preparatory organization will suit many people; it doesn’t match the way I work (though I do appreciate having a section to define characters in briefer detail). 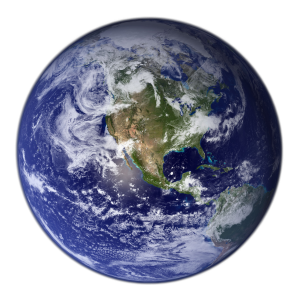 Other sections are devoted to narrative strands and locations and the program does a decent job of exporting to .pdf and .rtf formats, though some after-export tweaking may be necessary. 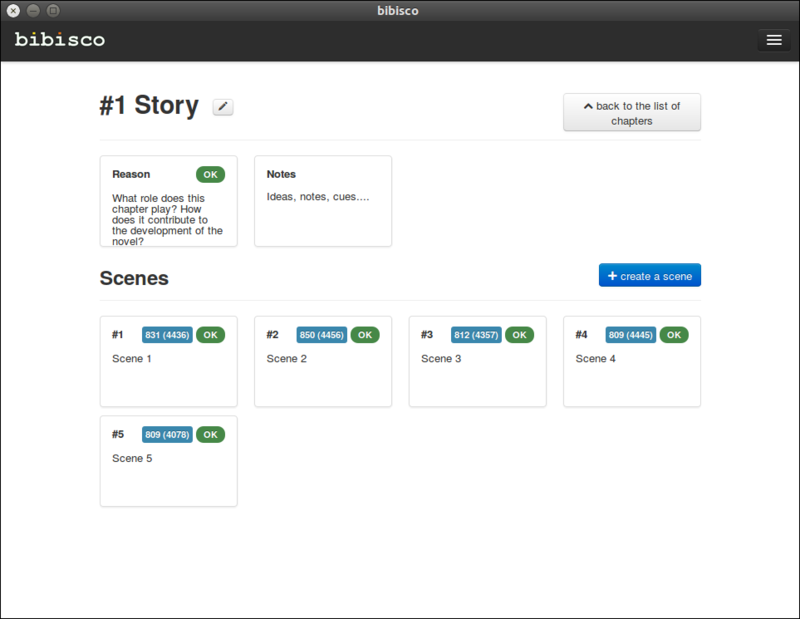 Bibisco: various scenes in a short story draft. Bibisco is Java-based and comes with its own runtime. It is the least attractive of the three programs we’re discussing here, in my opinion, and also the most rigid—there is no full-screen option, for example, let alone a distraction-free environment. 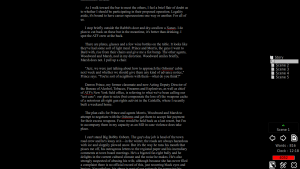 The main editing/writing window is rather small and can’t be resized. Nevertheless, if you can work within the software’s current constraints it does offer all the basics that planning a long work of fiction requires. Many people seem to like it and I think it does show some definite promise. 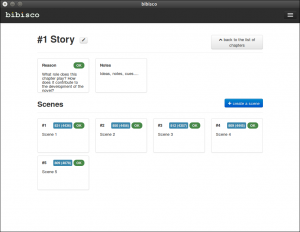 Bibisco’s editing/writing area, with chapters/scenes shown on the side. Manuskript and Plume Creator are more to my taste, both in the way they work and in their appearance. Both of these applications also come from Europe and were developed by Olivier Keshavjee (Manuskript) and Cyril Jacquet (Plume Creator). Let’s check Plume Creator first. The application is organized logically, with the editing/writing space prominent in the center and various tools located in panels to either side. The right panel can be hidden entirely and there is a distraction-free full-screen mode available. Many other tools in various stages of development are also available—for example, there is a “Workbench” view you can overlay on the main interface in which you can provide synopses, notes, POV and status for various scenes. 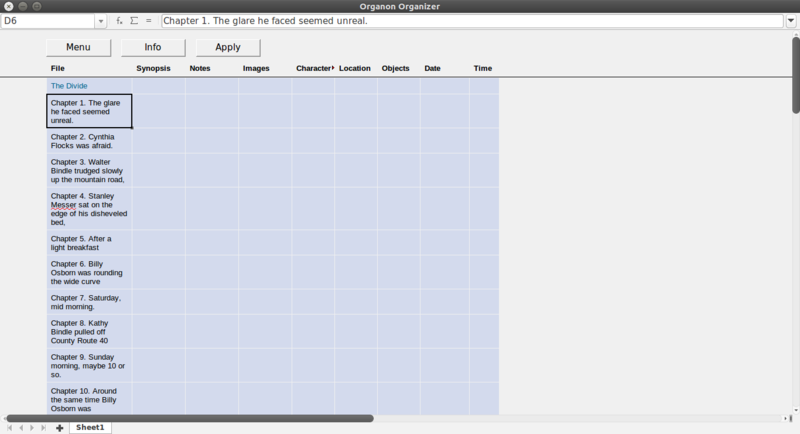 Workbench is somewhat akin to the Organizer view in Writer’s Organon plugin. There is also a separate, standalone Notes area—Plume Creator is in development and many features are still being sorted out. Despite this, the program seems quite stable and it offers a great deal of flexibility in how you arrange things. 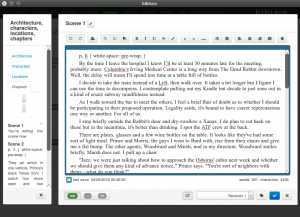 The Plume Creator interface, with tools to either side of the writing workspace. The program offers an attractive dark theme as an alternative to the light theme shown above, and as already noted there is a distraction-free mode. This lets you shift from scene to scene while still in full-screen view: quite handy. Plume Creator lets you move from scene to scene while in distraction-free mode. BTW, that red highlight on the 4,052 word count is to let me know that the story’s draft exceeds its target of 4,000 words. Again, quite handy. Plume Creator does an excellent job of autosaving your work and a credible job of exporting to .pdf and .odt (minor tweaking may be required). Given that this software has yet to reach version 1.0, it is quite impressive—I like it a lot. 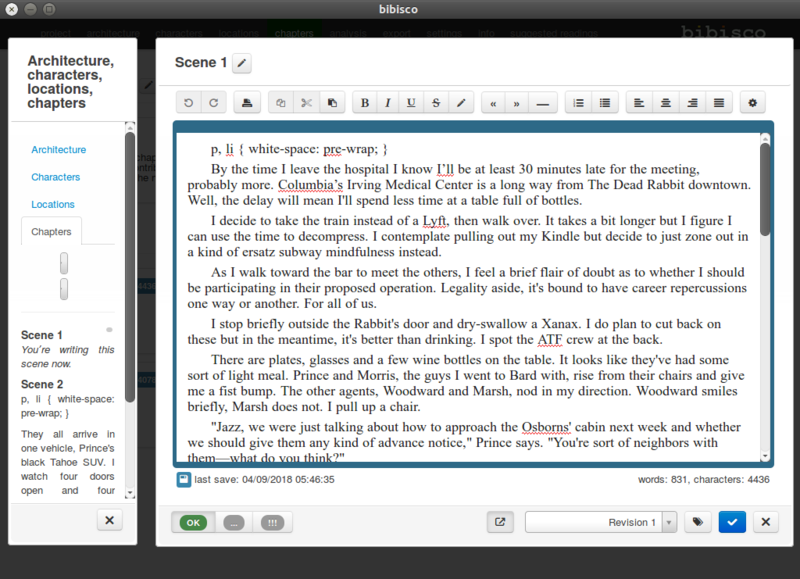 But my favorite of the three open source Scrivener-inspired programs we’re examining here is Manuskript. Like Plume Creator, Manuskript is logically organized with the writing area centered between two side tool panels. In this case, the left panel can disappear entirely while the right panel can be minimized. There is an excellent full-screen, distraction-free mode (borrowed from FocusWriter) which can be customized. The Manuskript interface. Note the diverse information in the Metadata panel at right. Manuskript, again like Plume Creator, is still working toward version 1.0. But the program seems very stable and I feel pretty confident my work is safe while using it (likewise with Plume Creator). I prefer Manuskript for its somewhat more intuitive organizational scheme and its somewhat greater flexibility; the program just “feels right” to me and I also think it looks more attractive than the other two. A customized distraction-free theme in Manuskript. 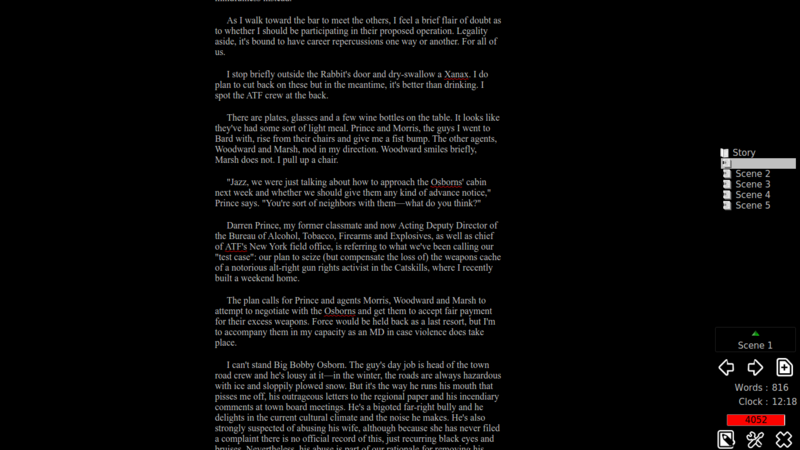 The bottom status bar with word count appears on mouseover. where “myprj” is the name of your Manuskript project. This will give you a LibreOffice Open Document file that at least separates your scenes properly. A more direct solution is to simply copy-and-paste finished scenes from Manuskript into LibreOffice Writer. I feel confident the developer will improve the export function in future versions of the program. And there you have it: a (relatively) brief overview of today’s most popular open source creative writing tools. Since all of these programs are available for both Windows and Mac you can easily try any of them that pique your interest. With luck, you’ll find a writing app that helps improve your workflow, provides some added privacy/security (as long as you download the software from the developers’ sites linked above) and saves you a bit of money in the process. So I wake up this morning to the cheery retro sound of the Beach Boys on my clock radio: “Wouldn’t It Be Nice.” Hmm—it usually plays Handel. But the Golden Oldie turns out to be a harbinger of better things to come as I drift downstairs for my first cup of coffee and fire up Firefox to check the Times site for the morning news. A worldwide change of heart. Photo: Wikipedia. I can’t believe what I’m reading—it seems as though the whole world has had some sort of spiritual awakening overnight while I slept. I give my coffee cup a suspicious glance—is this my usual blend?—take a cautious sip, and try to assimilate what I see and hear in numerous video clips and read in various breathless reports. Donald Trump announces that he now sees a new way forward to Making America Great Again, and will appoint Bernie Sanders and Elizabeth Warren as his closest advisers. He implies that, while he will retain the title of President for the remainder of his term, Sanders and Warren will be running the country on a day-to-day basis. Mitch McConnell and Paul Ryan both decide to resign from their respective leadership positions in the Senate and the House, and call upon their Republican colleagues to do the same. “It’s time to make room for more progressive thinking in Congress,” they say in a joint press release. Vladimir Putin and Kim Jong-un announce that both Russia and North Korea will abandon their nuclear arsenals at the conclusion of the upcoming summit with President Trump in May. “Nuclear weapons have cast a shadow of terror over the world for far too long,” the two leaders say in a coordinated announcement. Other nuclear powers suggest they will follow suit. Benjamin Netanyahu announces his resignation as Prime Minister of Israel, and also presents a comprehensive peace proposal that includes restoring all appropriate Palestinian lands and making generous reparation payments for all who died at the hands of Israeli forces since the nation’s founding. The proposal is widely applauded in the West and the Muslim world alike. Finally, I see that Wayne LaPierre, spokesman for the National Rifle Association, has decided to step down as well. He cites a profound change of heart as the reason, and urges people in general to turn in their guns and hunters to give up their sport. In a press release, P. J. Muddbottom of Barksplit, WI, a hunter, is quoted as saying he agrees with LaPierre and will henceforth stop hunting. “I never did like the way squirrel tasted anyway,” Muddbottom says. Then I feel a gentle hand on my shoulder. “Wake up,” my wife says. “Here’s some coffee.” Puzzled, I try to point to the cup I already have but it’s not there. My laptop screen is dark. Have I really dreamt all of this? I thank my wife and start up my computer for what seems the second time. I open the Times home page and see the world is conducting business as usual after all. I rub my eyes. My notepad with all its fantastic good news is nowhere to be seen. My coffee tastes bitter. Author tpletcherPosted on April 1, 2018 April 1, 2018 Categories Politics/HistoryTags April Fools Day, Benjamin Netanyahu, Bernie Sanders, Donald Trump, Elizabeth Warren, Kim Jong-un, Mitch McConnell, P. J. Muddbottom, Paul Ryan, U. S. News, Vladimir Putin, Wayne LaPierre, World NewsLeave a comment on Wouldn’t It Be Nice?